Former Secretary of State Hillary Clinton reflects on her own experiences as a mother and daughter in an excerpt of her upcoming memoir obtained by Vogue Magazine just in time for Mother's Day. The book, titled "Hard Choices," has been billed as a chronicle of Clinton's time in public life, but in it, Clinton also discusses some more private moments, including the lessons she learned from her own mother, Dorothy Rodham, and how she passed them along to her daughter Chelsea. "From the moment I first held Chelsea in my arms in the hospital in Little Rock, I knew my mission in life was to give her every opportunity to thrive," Clinton writes. "As she's grown up and stepped out into the world in her own right, my responsibilities have changed." Chelsea Clinton recently announced that she and husband Marc Mezvinsky are expecting a baby, and Hillary Clinton writes in the book that she's been looking forward to being a grandmother for many years. "And I've found myself thinking a lot about my relationship with my own mom, as an adult as well as in childhood, and what lessons I learned from her," she says. "When I became Secretary of State, Mom was just about to turn 90," Clinton writes. "She had been living with us in Washington for the past few years, ever since being alone in her apartment overlooking the zoo on Connecticut Avenue became too much. Like so many Americans of my generation, I felt both blessed to have these extra years with an aging parent and very responsible for making sure she was comfortable and well cared for. Mom gave me so much unconditional love and support when I was growing up in Park Ridge, Illinois; now it was my turn to support her. Of course I never would have let her hear me describe it that way. 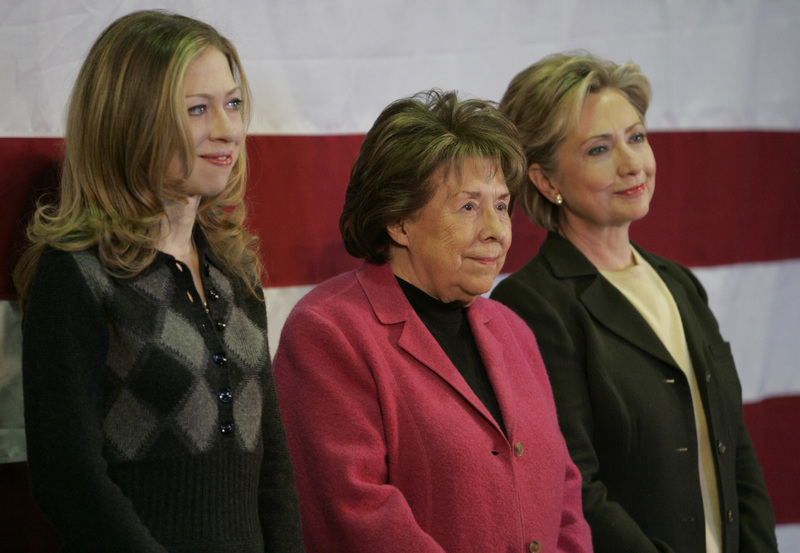 Dorothy Howell Rodham was a fiercely independent woman. She couldn't bear the thought of being a burden to anyone." "Having her so close became a source of great comfort to me, especially in the difficult period after the end of the 2008 campaign," Clinton recalls. "I'd come home from a long day at the Senate or the State Department, slide in next to her at the small table in our breakfast nook, and let everything just pour out." Clinton says she could not recall her mom ever looking happier than she did on the day of Chelsea's wedding in 2010. "She proudly walked down the aisle," Clinton writes, "and exulted over her joyful, radiant granddaughter." Clinton also discusses her mom's final days in 2011. Then secretary of state, Clinton was about to depart for a foreign trip when she got the news that her mom had been rushed to a D.C. hospital. "I quickly canceled the trip and sped there," she writes. "Bill, Chelsea, and Marc rushed down from New York, and my brothers and their wives, Hugh and Maria and Tony and Megan, arrived as quickly as they could. Mom was a fighter her entire life, but it was finally time to let go. I sat by her bedside and held her hand one last time. No one had a bigger influence on my life or did more to shape the person I became.